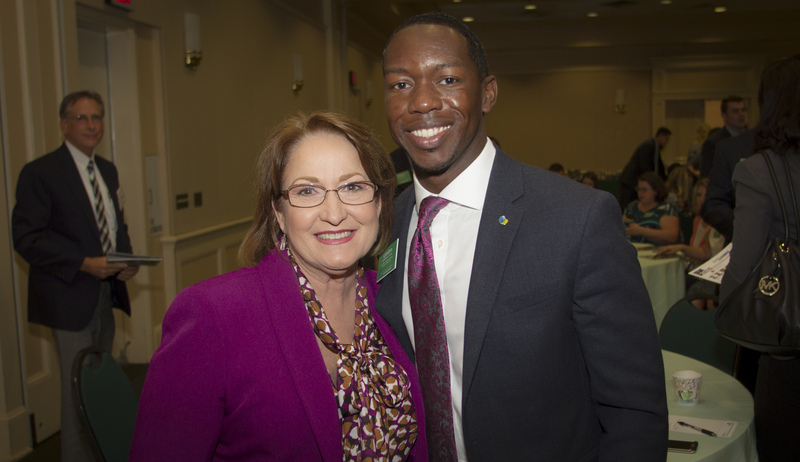 Orange County Mayor Teresa Jacobs joins Lyndon Carter, Chair of the Central Florida Partnership’s Young Professionals Advisory Council, on Aug. 17. Dozens of young professionals learned about Orange County’s new code and how it will impact future developments in the region during the Young Professionals Advisory Council (YPAC) meeting held on Aug. 17 at Harry P. Leu Gardens. Keynote speakers Orange County Mayor Teresa Jacobs and Orange County Planning Manager Alberto Vargas highlighted the County’s new code, known as Orange Code, and how the change will positively affect International Drive. As home to Orange County’s acclaimed Convention Center, a critical piece of the region’s tourism and hospitality industry, International Drive is an area that will be transformed with the updated code. The International Drive business community worked together with Orange County to develop the International Drive Strategic Vision Plan, which highlights goals for the area such as improved walkability, innovative development and increased transit options. YPAC members had the opportunity to provide feedback regarding what they would like developed or redeveloped on International Drive to help make it a pedestrian friendly destination that caters to both residents and visitors. Members were also invited to continue their engagement by attending board meetings and emailing their ideas and suggestions to Orange County’s Planning division. Consisting of more than 100 active members, YPAC was founded by the Central Florida Partnership, a collaborative of business and civic leaders committed to making regional impact on community issues, as a way to solicit consistent and thoughtful input from a younger generation. Learn more about Orange Code by visiting orangecodefl.com. To view photos from the YPAC meeting, visit Mayor Jacobs’ Flickr album.